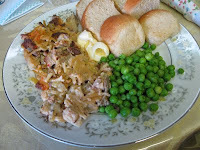 I had the "Chick" Tetrazzini with a side of peas, fresh all-grain bread and some kind of soy butter. 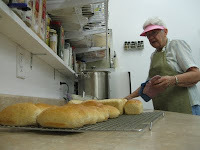 Barbara Neher opened the oven and pulled out pale loaves of all-grain bread. The 72-year-old great-grandma flicked the crusty tops, hoping to hear a hollow sound. Dissatisfied with the response, she shoved them back into the oven. The galley kitchen where Neher and her husband, Jack, prepared the day’s blue plate special was full of the yeasty aroma that greets customers at The Little Teapot Café, which opened last month at Bradford Square. The quilt-festooned décor, the spindly furniture, calico cloth napkins and the heady smells from the kitchen conjure up feelings of comfort and coziness. Teapot’s menu includes a daily blue plate special and homey items like potato salad, muffins and chili. “We get more people coming in who say, ‘I just feel like I’ve gone to my grandmother’s house,’” Neher said of the Teapot’s charm. But this isn’t your grandma’s cooking. Every dish the Nehers serve is vegan; free of meat, eggs, and dairy ingredients. Breads are cooked from scratch with an emphasis on whole grains. Baked goods use raw, organic sugar and flaxseed gel in place of eggs. “They’re all dishes you’re familiar with, but vegan,” Neher explained. Dishes like “Chick” Salad Sandwiches and Garden Patch Burgers, modeled after familiar comfort foods, are designed to be low-fat and low-cal. To add protein and meatiness, Teapot dishes rely on soy and wheat protein. And Neher’s spice rack spans one wall of the kitchen. “I’ve had vegan dishes before that were just blah,” she said with a frown. “Like sticks and twigs,” her husband chimed in. At the height of the lunch hour Monday, only a few customers wandered in. “Two taco salads,” said the Nerher’s daughter, Teresa Ingle, who works as a waitress at the Teapot. Barbara Neher arranged corn chips, vegetarian chili, fresh vegetables and vegetarian “cheeze” shreds on mis-matched China. In a town where many restaurant are shuttered before reaching one year in business, the Nehers were prepared to labor long. They see their café as a mission to improve the health of the city rather than a money-making venture. The Nehers are devout in their faith, but say they use the restaurant to spread a message of healthy eating, not religious beliefs. 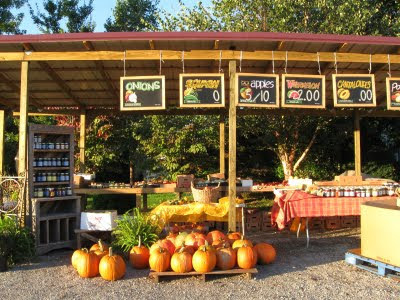 Adjacent to the dining room, the Nehers have set up rows of student desks and a book display with healthy cookbooks. “We have free health classes, but you have to buy the textbook,” Jack Neher said. Classes take place at 7 p.m. Tuesdays and Thursdays and the next session begins Oct. 20, he added. For Ingle, that power allowed her to drop 100 pounds and control her diabetes. Her mother said the changes her family has made have had great rewards, and that she hopes the café could help people ease into a new lifestyle. Neher is no stranger to championing causes. In 2004, she, her husband and Ingle founded the It’s My Very Own: Bags of Love program to provide blankets and toiletries for children who have recently been move to foster care. With The Little Teapot Café, the Nehers hope to continue their family tradition of ministering to people in a way that conforts them. Emily Parrino can be reached at 270-887-3237 or eparrino@kentuckynewera.com. My cousin, John Tilsch, came for a visit as he was traveling across the country from Chicago to his new home in Colorado. He studied at Vandy, so southern barbecue (meat-n-threes) are familar to him. We got Woodshed pulled pork and plenty of pie. My mom was nice enough to give me a bunch of canned salmon... another good way to get some affordable omega-3s in our diet. I made my patties with Italian style bread crumbs, and some salmon seasoning mix, chopped onion and 1 egg. I pan fried them in olive oil and served them over fresh spinach drizzled with honey mustard. This is just a random picture of what I think is some really beautiful sushi from Tokyo Sushi in Paducah. I loved the generous sprinkling of green caviar...it looks like fat colored sugar crystals. There were also some fat orange fish roe inside... tobiko? I've been back at the New Era part time since the middle of September. Being out of the house more puts me in contact with more blog-worthy food topics, but it also eliminates my time for blogging. My mom gave me a bag of Trader Joe's unsalted, roasted cashews recently and I'd been thinking about the cashew stir-fries I enjoyed in Bangkok a few years ago when my friend, Priscilla, and I met there for a mini-vacation. So this was my best approximation. I served it over bean threads simmered in the leftover juices. Start with 1/2 cup cashews, heated in a little oil on medium heat until toasted. Add 8 ounces of white mushrooms, halved or quartered depending on how big they are. Chopped red and green bell pepper, sweet onion, and chopped garlic come next. Add a tablespoon of oyster sauce, a splash of soy sauce and rice vinegar, and maybe a tablesoon of sugar along with garlic powder to taste. Last, add 1/2 a chicken breast, cubed and cook until done. Reserve the juices to add to a little water to simmer two bundles of mung bean thread noodles until translucent and soft. Joe ordered rack of lamb and I shared my salmon with steamed vegetables with Stephen. They were nice enough to cook my vegetables extra-mushy (as in mushy enough to eat with 2 1/2 teeth) on request. The portions weren't huge, but everything was so well salted that I felt very full. The salmon was perfectly cooked and crispy on the edges. Joe like his lamb so much he even at the fat. If you know my husband's aversion to grissle, you'll understand what a big compliment to the chef that was! Joe and I started a family tradition when we bought the anthropomorphic cushaw squash a couple years ago. 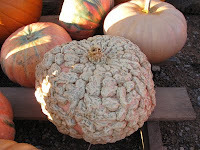 We decided every autumn we should buy an unusual gourd. We also felt we had to get Stephen his first pumpkin. 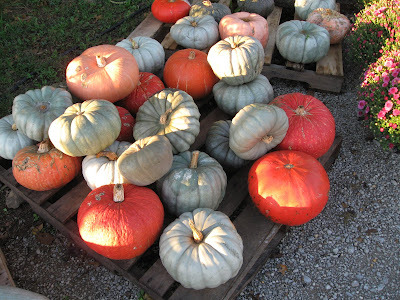 A little pie pumpkin for baby, turban squash for mom and dad. I'm looking forward to making these into something... I just haven't settled on the right recipe yet. Since Joe's been student teaching, I've been looking for ways to feed us as cheaply as possible without giving up the four food groups. I found Aldi's bag of frozen whiting filets, at $3.49 for 24 ounces, are probably the cheapest non-fishstick seafood available in Hoptown. But that's excluding whatever lurks in Little River. So, since The Po'Boy closed, I've been craving a grilled fish sandwich. The whiting cooks nicely in the oven or skillet, either breaded or plain. It wears lemon juice, garlic powder and herbs well. And the unpleasantly fishy odor disappears once it's been cooked. Joe has to peel off the skin before he can eat it, but other than that, these fillets are ready to go. I served mine sauteed over garlic baguette, with garden tomato, a sprinkling of sweet corn and lemon juice. I just found this photo of something I concocted way back in August when Tatiana was still living with us. My phyllo had been hiding in the back of the freezer from some time, so it had that sharp past-its-prime flavor. Also, I think this would have been much better with some thick greek yogurt for dipping. I don't remember what I put in it... just that it was ground chicken, cauliflower, curry powder, garam masala, cayenne and probably some garlic and onion. Then I wrapped it in three sheets phyllo, rubbed with oil, then baked until crispy. Spinach quiche with homemade oil crust. I followed a recipe that called for milk in the crust. I don't think I've got the touch to make a flaky oil crust, but it did taste good. Stephen was crazy about this stuff. I made two pies, and he pretty much ate half of one by himself. A simple chickpea salad with cucumber, balsamic vinegar, olive oil, onion and tomato. I love chickpeas in most forms, so I liked this dish as well. Coconut veggie curry. I took a can of coconut milk, some chinese curry powder, garlic powder, splash of fish sauce, juice of a lime, salt, a little sugar, canned carrots, broccoli and cabbage and simmered it all until tender. I served it over some Vietnamese noodles. A few weeks later I tried the same thing but used sweet potato, white potato, cauliflower and broccoli and served it over rice.